The Juvenile In Justice photo-essay depicts a different aspect of "American Exceptionalism"—an exceptionalism that jails 60,000 of its young on a typical day. Many environments into which our youth are abandoned to a chaotic fate are so deprived, dysfunctional, and detrimental that our streets and juvenile jails can be rationalized as sources of stability! Unsurprisingly, many of these juveniles will continue their "stabilization" in our prisons, which are even more deprived, dysfunctional, and detrimental than their prior youthful environment, the streets, or juvenile jails. Hopefully our leaders will stop preaching American Exceptionalism to our fast changing citizenry and begin proposing modern solutions1 to some of our most difficult problems. ...our unstable, unfit, unwell, and unbalanced "new" alt-white-house et al. just "keeping America great"?...again! UPDATED 03/13/2017 Ted, How Jails Extort the Poor; Salil Dudani San Francisco jails are 85% full of pretrial detainees. You just can't make this stuff up—"exceptional" America, where no econoimic activity is too dystopian to count toward Gross Domestic Product (GDP)! Today's "criminal justice system" is little more than a processional of passionately misinformed prosecutors and politicians chanting "aren't we exceptional" while waving discomforting and distracting pompoms. You must understand that which you are systematically (i.e. not randomly or arbitrarily) trying to change. Pending the development and implementation of such an understanding well designed experimental "pilot projects" may obviate or mitigate many of the harmful impacts of our random and arbitrary system of criminal justice. UPDATED 06/22/2014 An approximately year old video (recently released after persistent press cajole) depicts a large prisoner (Daniel Rodrigo Saenz) with hands cuffed behind his back being dragged through the multilevel El Paso County jail to an outside dock, reportedly for the purpose of transporting to a hospital after an onsite self inflicted head injury. The handcuffed prisoner was fatally shot by an El Paso, Texas police officer (Jose Flores) while flailing about on the dock. No hospital transport vehicle (presumably an ambulance) is depicted in the video at the time of the shooting (approximately 18:00 of 43:28 minutes). A stretcher appears and the handcuffed and dying or dead prisoner is wheeled off (approximately 25:00-26:30). Later wider angle view shows ambulance arrival (approximately 37:50). A Hollywood director could not direct a more representative depiction of our nation's dystopian prison system. UPDATED 06/20/2012 David Dow summarizes his prescient talk with a time tested capitalist phrase, "pay me now or pay me later"—unfortunately for our nation, crime victims, incarcerated and executed our current penal model is obsolete, dysfunctional, ineffective, destructive and costly. 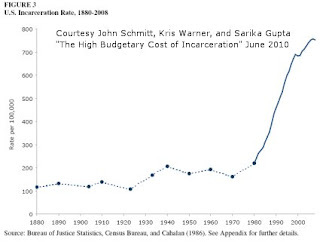 Fortunately, exogenous economic shocks (Great Recession) have intervened to slow continued pursuit of our penal model. 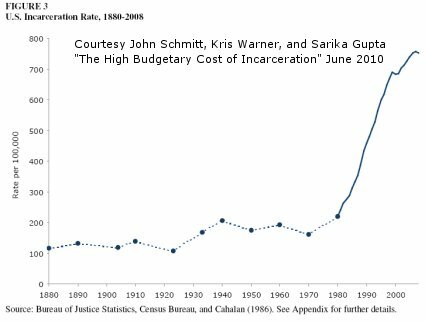 Revising our penal model will require dramatic and significant changes to existing civil society structures3—there are little or no data to suggest such revisions are imminent2. UPDATED 05/11/2016 NPR, Is America Engaged In A 'Vicious Cycle' Of Jailing The Poor? Send "reminders" to reform our jails—really? !—how about dismantle our entire dystopian criminal injustice system and begin anew!? If your city leaders are perpetually debating whether to replace a current police chief or building new jails they don't, yet understand the problems, much less asking relevant questions or embracing modern methods and solutions! UPDATED 01/26/2016 Reuters, Obama bans solitary confinement for juveniles in federal prisons and WP, Barack Obama: Why we must rethink solitary confinement A tiny symbolic step on a long road to dismantle our destructive and dystopian prison systems (federal and state). There is no need to "rethink" and "reform" our existing prison systems as these words imply initial thought and partial preservation, respectively. UPDATED 0727/2015 MJ, Can a Public Defender Really Handle 700 Cases a Year? Mr. President, put your presidential prison commutations for federal non-violent drug sentences and other non-violent sentences on a presidential auto-pen. Maybe our governors will follow and clear out our ineffective, unhealthy and bloated state prisons? Frighteningly, it's not the structural and conceptual irreparability of our current juvenile and adult prison systems that most staggers a thinking mind—more mind-staggering is that a significant proportion of our leaders and population lament their inability to continue funding these irreparable prison systems. Dysfunctional generously describes the state of our currently dystopian prison systems in "exceptional America"! Kudos to our United States Attorney General—there is no need to await a (any) commission's input or report to begin the process of completely dismantling our terminally dysfunctional prison system. It is not remarkable that those constructing, participating in, or supporting a (any) dysfunctional system will have difficulty perceiving the need to dismantle it—a principle not unique to our terminally dysfunctional prison system. But, these perceptions need not delay beginning the process of dismantling our terminally dysfunctional prison system. It is worth noting that our United States Attorney General's action in not awaiting a commission's report is an infinitesimally modest action when compared to the immediate actions required to completely dismantle our terminally dysfunctional prison system. Pilgrims, Puritan and medieval religious sects would find it challenging to create more dysfunctional, disastrous, or distorted torture "tools" for effecting or affecting human behavior. Surely, a modern civil society demands more meaningful and effective employment opportunities for 10,000 plus prison guards? "Data showed that the top 20 percent of Americans received 48 percent of all income while those in the bottom 20 percent got less than 5 percent...In 2011, roughly 23.5 million, or 37 percent, of U.S. children lived in working poor families compared with about 21 million, or 33 percent, in 2007, the report (pdf) said." 1. Juvenile jails, prisons, believing in "God", praying, hard work, abuse, coercion etc. are no longer sufficient problem solvers, if they ever were. 2. There are some data to suggest a growing realization that our current penal model is obsolete, dysfunctional, ineffective, destructive and costly—the good news is that realization usually precedes dissatisfaction and revision. 3. Surprisingly little data exists to model civil society structural changes—more indicative of religion than science.